I recently got a Roku, so I switched my Netflix subscription from DVD by mail to streaming. Lately, I’ve been watching episodes of Burn Notice, which is about a spy who gets ousted from the government by an unknown conspirator. This in turn forces him to make a living by taking on odd jobs requiring him to help people who’ve inadvertently gotten in trouble with the seedy criminal underworld of Miami. So far the show has taught me how to hide sensitive documents in secure locations, how to escape if I ever get handcuffed to a wooden chair, and how to trap criminals in their car in a narrow alley. But, most importantly, it’s taught me that I never want to date money launderers, arms dealers, or con artists. According to the show, these skeezy individuals never have just one girlfriend. Their girls appear to travel in packs of four, mostly so they can dance in a group while the crooked boyfriend makes his next underworld business. deal in the VIP room of a posh nightclub. When the poor girl does get some time alone with the guy, it’s likely to be interrupted by the approach of another criminal type. She’ll be dismissed with a harsh, “Get outta here!” Generally, this doesn’t seem to phase her though because she can join the group dance again and wait for her boyfriend to eventually call to celebrate the smuggling of a million dollar shipment of narcotics to a rich CEO who has wired money to him via an offshore account. Why, my blog readers might ask, am I thinking about this today? 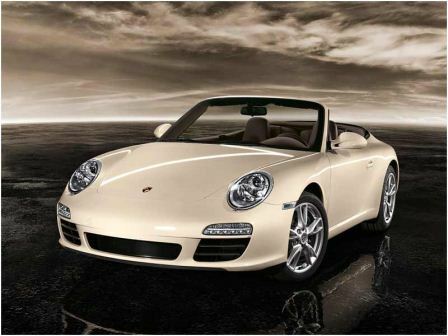 Well, my musings were prompted when I saw a Porsche Carrera parked in the Home Depot parking lot today. I’m pretty sure this is the type of car that any of the off-limits boyfriends noted above would drive. I’m guessing this especially because the front vanity plate said “saunas.” Since the convertible top was down, I strolled past the Porsche to take a peek inside; it’s just not everyday that I see one in the Home Depot parking lot. What I saw added another reason to not become a gangsta girlfriend. I would have to ride around in one of these cars, and there simply is no legroom. I think my Barbies had more legroom in their convertibles, and they didn’t even have fully functioning knees. The owners of the Porsche and Corvette were probably just there to pick up some pressure-treated lumber for their back decks.